Summer may be almost over, but that doesn’t mean it’s time for the kids to stay cooped up indoors playing video games and watching TV. In September, the weather is ideal for taking part in plenty of alfresco adventures. Here are 10 family-friendly outdoor activities that are virtually free. Fly a Kite – Take advantage of a crisp, clear day with a light-to-medium breeze to fly a kite. New to kite flying? Here is a site that has lots of kite flying tips and tricks. Collect Nature – Bring a little bit of the outdoors in. Collect pine cones, colorful leaves, twigs, acorns, rocks and other natural treasures. Help your children search online to learn more about their findings, and check out our Pinterest board for some great nature craft ideas. Jump in a Pile of Leaves – If the leaves have fallen where you live, it’s time to rake them in a pile and jump in! 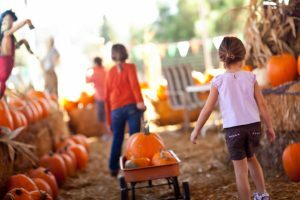 You’re never too old to enjoy this fun and quintessential fall activity! Take a Hike – Head to a park or trail and explore flora and fauna while getting some healthy exercise. Have a Nature Scavenger Hunt – Make a list of items that are typically found in your yard or neighborhood. Things to include could be a stick, pinecone, a pebble, a seed, clover leaf, etc. Give your children a bag to collect the items, and a time limit to find all the things. The person who collects the most things on the list first, wins. Bob for Apples – In September, it’s still warm enough to enjoy getting wet outside – and when you play bobbing for apples, you are sure to get wet! This classic game will give everyone a lot of laughs. For tips on how to set up a bobbing for apples game, click here. Make a Scarecrow – Using hay, twine, old clothes and scraps from around the house, you and your family can create a scarecrow for your garden or yard. Get creative! Here are some basic scarecrow building tips to get you started. Go Animal Watching – From squirrels running up trees to migrating birds, your own neighborhood is probably filled with wildlife that you miss during your day-to-day activities. Spend some time looking and listening and you might be surprised at what you find! Celebrate the Autumnal Equinox – The 2014 fall season officially begins with the autumnal equinox on September 22. During the autumnal equinox the day and night are of equal length. In ancient times, agricultural communities would celebrate the autumnal equinox and the bounty of the harvest. Today, some families like to mark the day by picking apples, bringing out the fall decorations, collecting food for a local food bank, or having a campfire and telling stories. Stargaze – On a clear, moonless night, head outside and take in the starlit sky. But before you do, you might want to go online to learn more about the stars and planets, and how you and your children can make the most of your stargazing. Sky & Telescope is an excellent online resource for star maps and observation tips, plus check out the week’s Sky at a Glance section highlighting current celestial events.